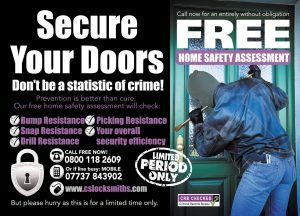 For the last decade Cerberus Security of Sawston have been at the forefront of East Anglia’s top rated locksmiths. With literally thousands of happy customers this trusted local family run business with an average response time of only 30 minutes will not disappoint! We understand the concerns that go hand in hand with entrusting your families security to a complete stranger. We hope that you will allow us the chance to prove to you that not all tradesmen, and women, are out to take advantage and that some of us genuinely care about our customers. Cerberus Security locksmiths have been serving Cambridgeshire and the surrounding areas from the same location in Sawston since day one. We have never changed our trading name or phone number and we will always be contactable should you need us to honour our promise. We are physically located in Sawston and are not a call centre 200 miles away claiming to be local! Do not be fooled by these pretenders. Some of these firms do not even have a single locksmith in their employ. What they do is promise you an engineer within the hour and then start calling locksmiths in your area such as ourselves asking us to cover the job for them. If they cannot find someone they will wait for you to call asking where is your engineer and then make some excuse (his vans broken down being a favourite) at which time it may be too late to find another. We have been at the same address in Sawston since day one and have never changed our trading name or phone numbers. We will always be contactable should you need us. Call us direct to save time and money on Cambridge (01223) 902234 or save our number ICE. We will not let you down! Including – Sawston, Pampisford, Whittlesford, Babraham, Stapleford, Great Abington, Duxford, Great Shelford, Little Shelford, Hinxton, Little Abington, Hauxton, Thriplow, Ickleton, Harston, Great Chesterford, Trumpington, Fowlmere, Cherry Hinton, Foxton, Fulbourn & Little Chesterford to name but a few!